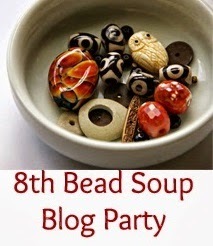 8th Bead Soup Party Reveal! 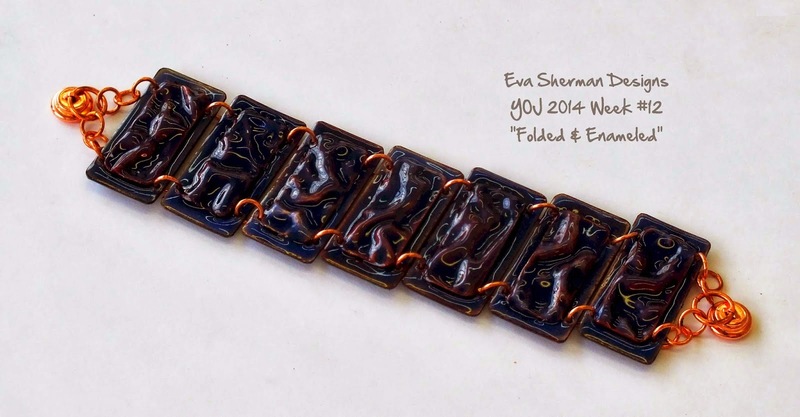 with Eva Sherman from Eva Sherman Designs. I was sent the most inspiring and delicious soup with which to create. It included lamp work beads, blue freshwater pearls, and a bold sterling silver clasp. I set to work quickly planning and sketching. I'll save the details for the end. 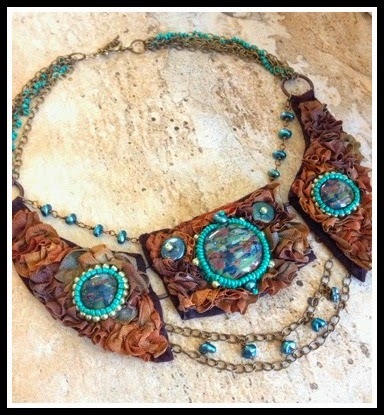 I call this neck piece "Post-Apocalyptic Bliss" because really, the end doesn't have to be ugly. Scroll to the bottom of the post to see pictures of how it was made. My friend Erika from Moonstruck Design modeled for me and she completely rocked it. She reported that is very soft and light to wear. all the detail on my first piece, I was ready for some simplicity. I connected the acrylic links with simple jump rings. It is lightweight and fun to wear. It makes a soft jingle when you move. 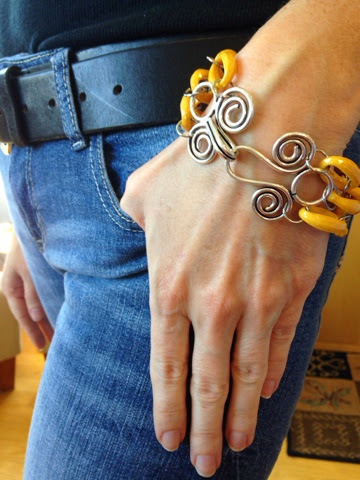 I bent the clasp slightly to form to the curve of the wrist. I wore it to the grocery store and felt absolutely maaarvelous, daaarrling. 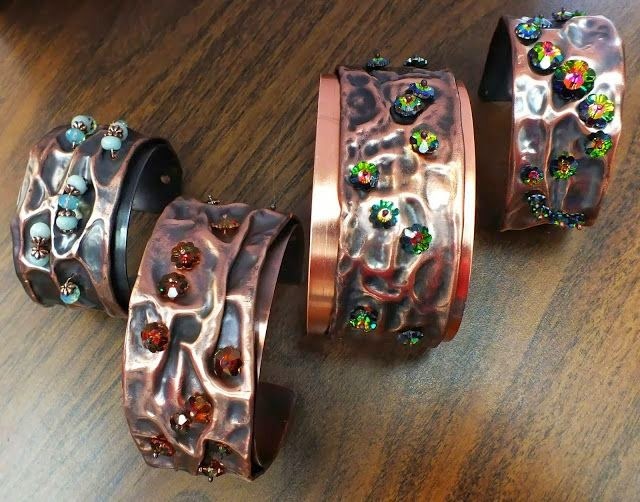 Head over to her blog to check out what she created using these beads! and some antique tube beads. I topped it off with a coil of oiled iron wire. Now a little about the process of creating the Post-Apocalyptic Bliss piece. hand dyed ribbon by stitching the edge in a randomly ruffly way. connecting rings would function properly when in use, on an actual neck. at one point while I adjusted the drape. It looked the best on my husband, but he wouldn't model. traveled with me for over twelve years and was given to me by a dear friend. I was so happy to be able to use it to cover the back of the piece, close to the skin. See the clasp in the background? She's wondering "what about me?" 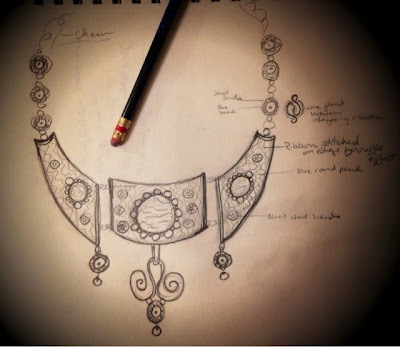 Pondering chain or links to complete the necklace. 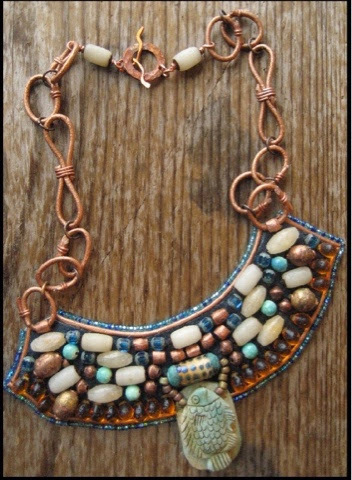 In the end I chose five strands of brass chain with the addition of seed beads onto the middle chain links for a little color. They are the same seed beads I used around the focal. If you've made it this far and you're totally jazzed about seeing how people take what they've been randomly given and transform it into their own interpretation of beauty, check out all the participants in the blog hop HERE. You won't run out of eye candy as the list is 400 people long. I want to thank Eva for her generous contribution and her creative camaraderie and Lori Anderson and her small team of assistants for being the powerhouse behind this grand and beautiful undertaking. There's something about this challenge that gets me fired up and I hope it does the same for you. Bead Well and Prosper my dears! 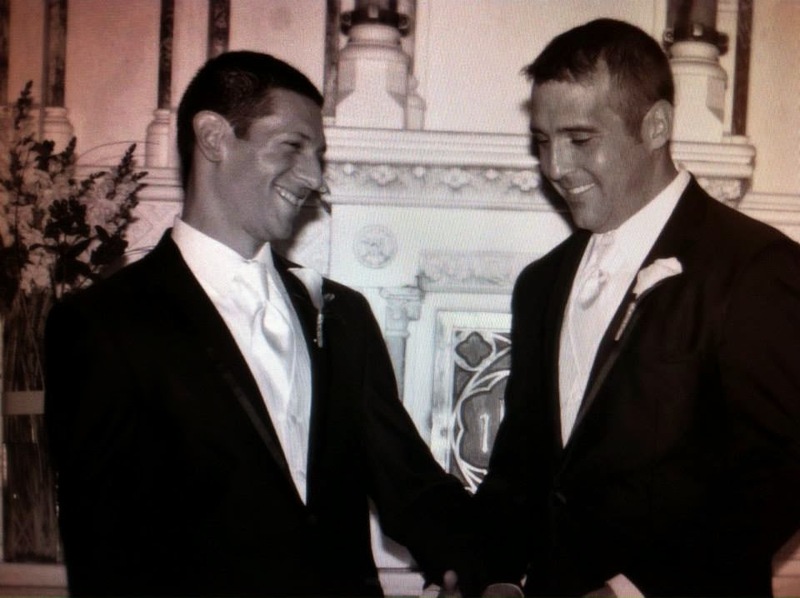 In August 2013 my brother in law, Darren Manzella- Laperia, was lifted abruptly into the arms of God. Our family reeled. He had been married less than two months to the love of his life. It was a beautiful ceremony honoring everlasting love. Darren was a soldier who spoke out against inequality and advocated gay rights. His open admission of his sexuality while serving in the US Army was instrumental in the changing of the "Don't Ask, Don't Tell" policy. He was discharged for speaking his truth but after the policy change, he wasted no time reenlisting. He spent his days before he left us using both his experience as a soldier and his training in psychology to council troubled veterans and help them find peace and hope in their post-war lives. Here is a nicely written article written about Darren after his death. There are many more to be found as he touched so many lives with his bravery and kindness. To honor his life and his memory, his family and friends have organized a 5K Memorial Run in his hometown of Brocton, New York. Proceeds from the event will go towards Darren Manzella-Lapeira Veteran Assistance Fund through the Chautauqua County Community Foundation. Through this fund, local veterans will be able to seek financial assistance for immediate needs such as rent, groceries and utilities with the help of the Chautauqua County Veterans Service Agency. 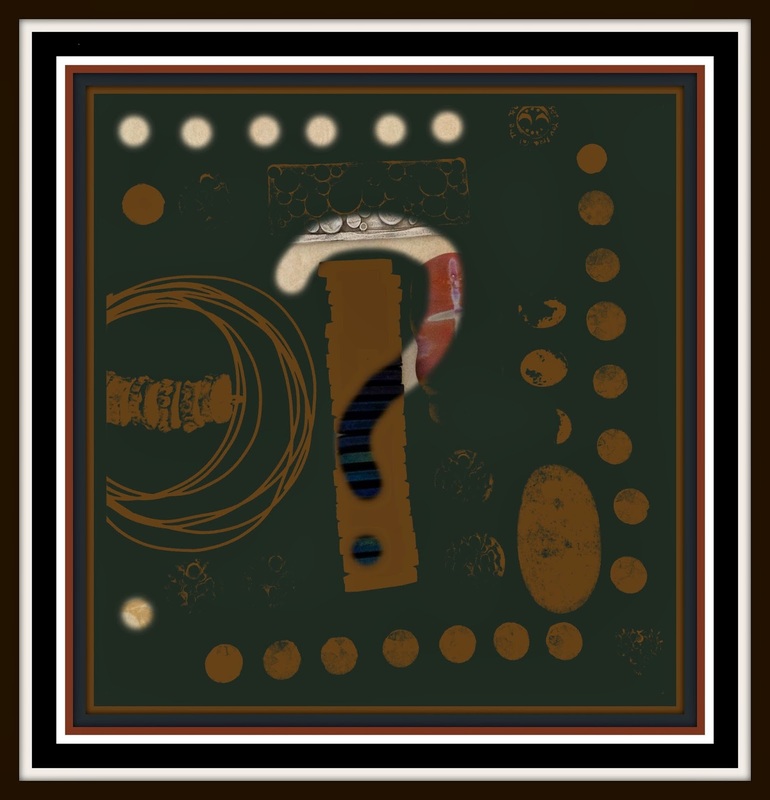 Many people have wondered why the symbol of a heart with an infinity sign was chosen as a logo for the run. 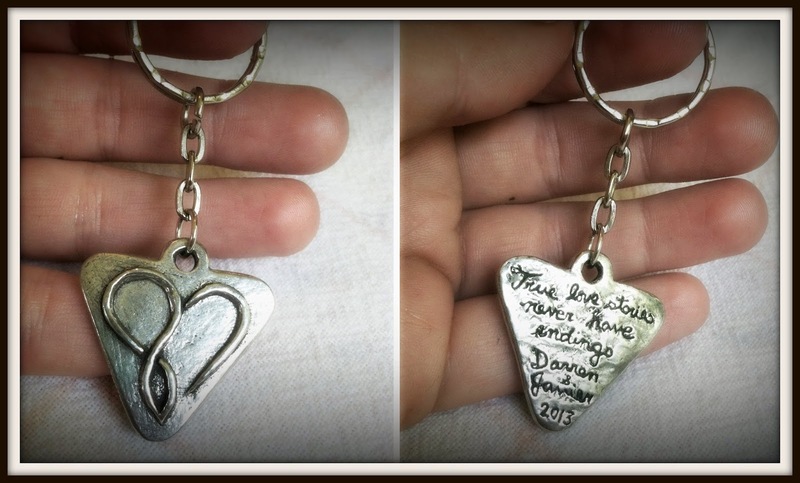 It was also the symbol for Darren and Javier's wedding. I had the honor of designing and producing the wedding favors and gifts for the wedding party. The image that Darren and Javier chose to represent their unending love for each other has also become a symbol for our love for Darren. And his for his friends and family. Here you see the sketches I made for their approval and the original sculpts in clay. This is an image of the mold after it was made with the original sculpts. the lines out to the pieces are small channels called sprues. 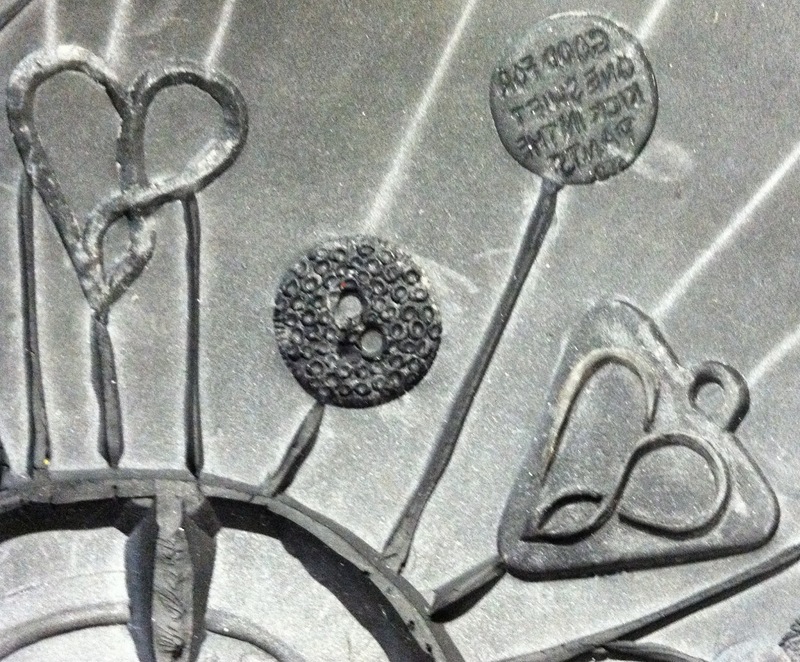 They allow the pewter to flow out from the center of the mold to the pieces. 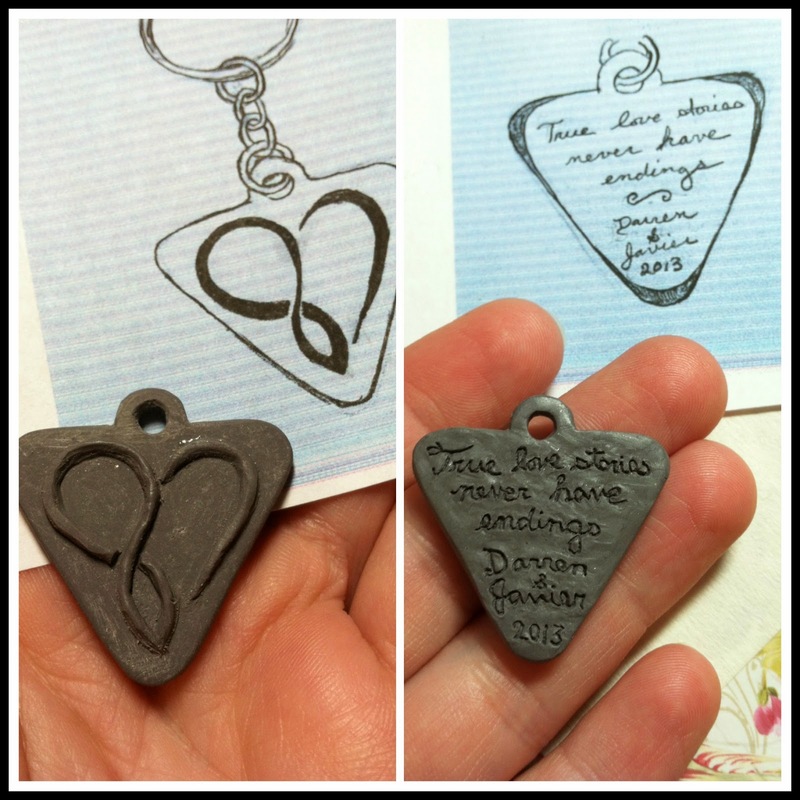 The original sculpt of the pendants given to the wedding party and women in the immediate family. I will be creating two necklaces featuring these pendants and donating them to the Chinese Auction fund raiser during the 5K Memorial Run. And two of the finished pendants cast in fine lead free pewter. May your light continue to shine in the hearts of those that knew you. Your gift of laughter and compassion radiates long after you left this earth. I look forward to the day I see you again." My ingredients are here and I am in love with the colors! 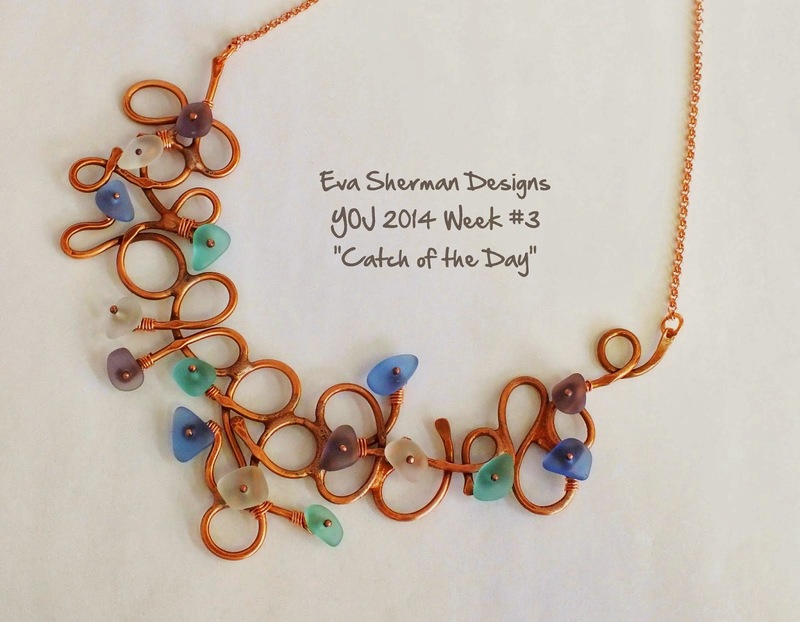 The glass looks like a coral reef which pairs perfectly with the blue freshwater pearls. 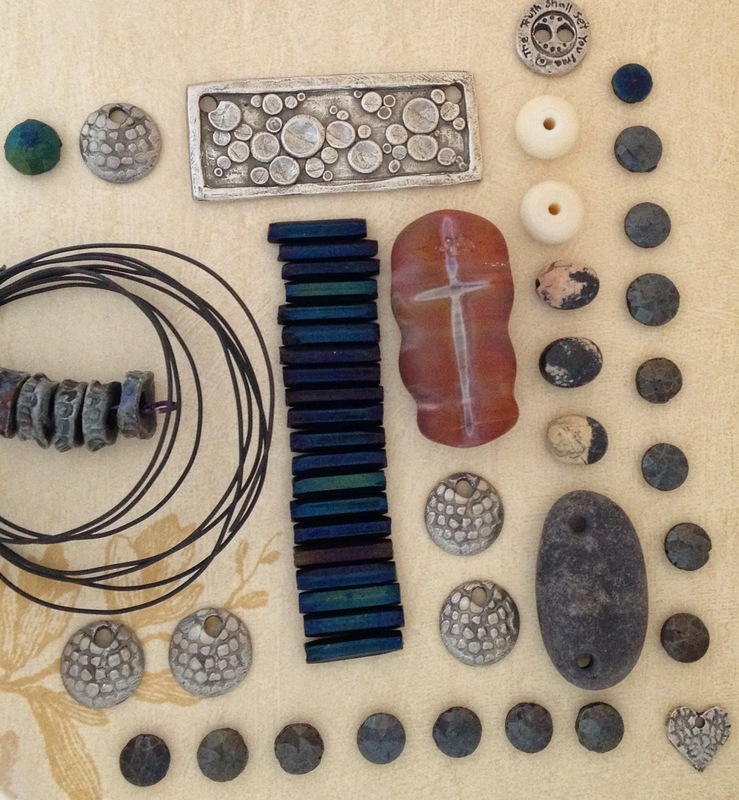 Thank you Eva Sherman for my delicious bead soup ingredients!! and sightseeing in the lovely city of Buffalo! 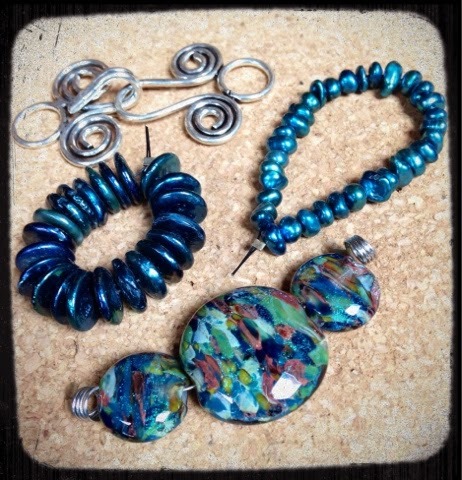 I've been simmering with ideas all winter and now it's time for a bead feast! from around the world swap beady goodness then blog about what they make with said goodness. The extraordinary part of this is that there is ONE woman who does the pairing (Sweet Sweet Lori Anderson). She pairs people by visiting every.single.blog.and chooses partners based on things like experience and medium and location. 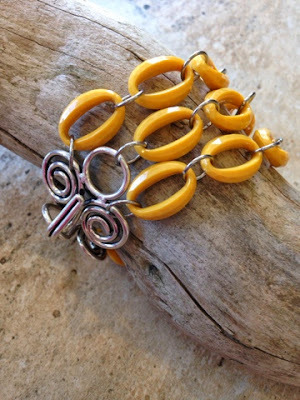 This is my second time participating in the Bead Soup Blog Party. Last year Lori let some Facebookers into the kitchen and I was one of the lucky ones. 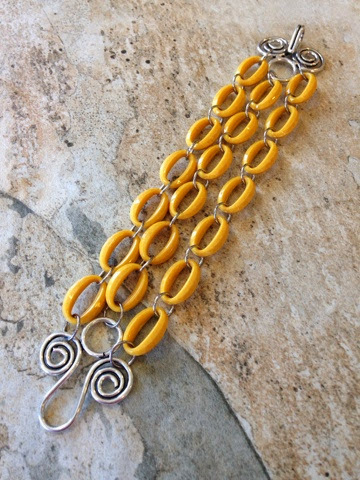 My partner was Claire Hasemeier and it was a great experience meeting her and seeing her creations with the bead soup I sent her! It prompted my arrival into the blogosphere, and I am grateful for the opportunity to participate again. and will no doubt be attending book signings and jewelry making celebrations for a while! 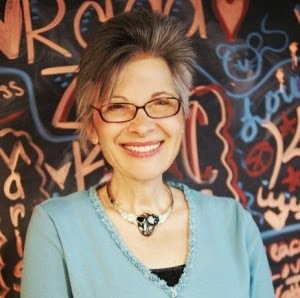 I have a sweet spot for her former life as an architect,(it was my first choice in college) and admire her dedication to her art and travels. to see how the collection will be transformed in her style. I will be posting pictures of the beautiful soup I received and keep you updated on my design progress. So here's the scoop as of late! It's called an Actual Factual Sale. I have always offered casting to order but soon all of my casting equipment will be unavailable as it makes a short and quite complicated trip. It will be moving from my damp shed studio to my new, super awesome, custom built area of The Man's garage. What I will be doing to get ready for this special sale is adjusting my inventory numbers to reflect the Actual Factual quantities. When the sale launches, all items listed (and only items listed) will be 20% off. For a week! I will be shipping as fast as the orders come in. This sale will take place on the full moon- the 24th of May, and last until the 31st of May. I will be listing everything I have cast right now, some items are experimental and some are just plain odd, but all will be 20% off. Here are some pictures of my inventory drawers to whet your whistle. That's right, I'm letting you take a peek inside my drawers. You may see some familiar items and some other bits. The only things not included will be custom work. I hope you will join me on May 24th for my Actual Factual Sale! Until my studio is reset and in functioning order, this will be my only inventory. I know it will be set up before the winter but construction will be taking place throughout the summer months and I cannot guarantee the building speed of The Man. * The Man really is harmless. He is a sweetie and it is my job to tease him whenever we're not smooching. Don't report him to animal control, please!